Is a quiche a quiche if there are no eggs and cream involved? Is pastry dough pastry dough if zero butter was used in the making of it? 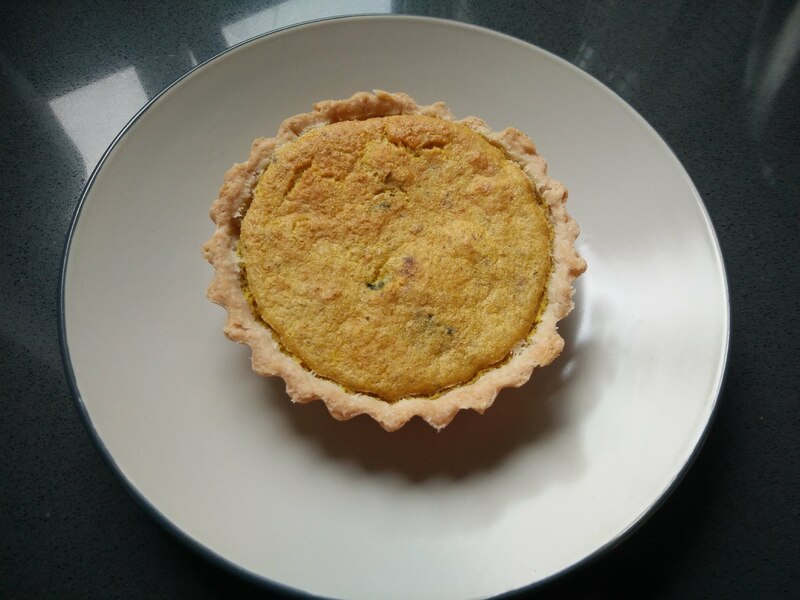 Maybe I should call this recipe a vegan vegetable tart, instead of a quiche, just to be safe from all the people complaining about veg*n calling dishes the same as their not veg*n counterparts, just because it’s easier to convey what kind of dish it is. In any case, this vegan tart can be adapted to whichever (seasonal) vegetables you want to use. The base can be used for sweet as well as savory tarts. 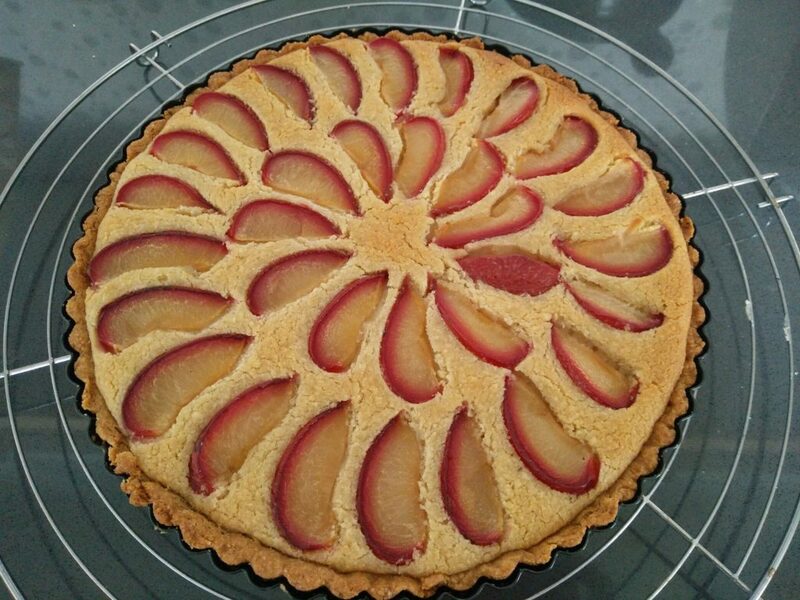 Fruit pies, frangipane tart, veggie tarts! The uses are pretty much endless. I tried this crust a couple of times, to make sure the first time wasn’t just a fluke. And it wasn’t. The next step will be finding a gluten-free flour mix with which the recipe works well. In the bowl of a food processor or stand mixer with paddle attachment, mix the flour and salt. 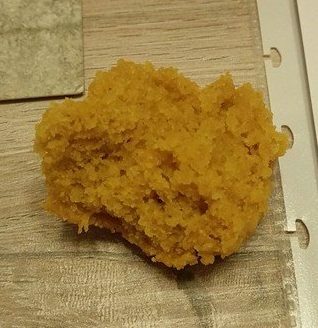 Add the coconut oil in small(ish)1 pieces, and mix or process until only very small pieces of oil are left and it looks like a crumble. With the machine still running, add the cold water, one tablespoon at a time, until a cohesive dough forms. Not all water might be needed. Remove dough from processor / mixer, give it a quick knead to bring it all together, and start rolling out. For individual / mini quiches, cut the dough in pieces2 before rolling each individually about 3 mm thick. Line each tart mold, carefully pushing the dough into the crimps. Set aside in the fridge3 before filling and baking. Chop the onion. Cut the mushrooms in quarters. Mix both and spread in a (lined, for easier cleaning) baking tray. Spray some olive oil, season with salt and pepper. Bake mushrooms for 20 minutes, until golden brown. Remove from the oven and let cool. Meanwhile, thaw the spinach. Squeeze as much liquid as possible and chop finely. If using fresh spinach, chop & saute in a bit of oil until wilted and the liquid has evaporated. Allow spinach to cool. Then mix with the mushrooms. Note: this tart can be made with any vegetables you want. Calculate 700-750 grams of vegetables in total. In a blender, mix tofu and water together. In a bowl, mix chickpea flour & spices with a whisk. Add the mixed tofu to the chickpea flour and mix to combine. Let it rest about 10 minutes before proceeding. Take the lined tins out of the fridge, divide veggies between the tins, then pour custard to fill the crust4. Place the tins on a baking tray. Bake 20-25 minutes until set and golden. Remove from tins and serve. 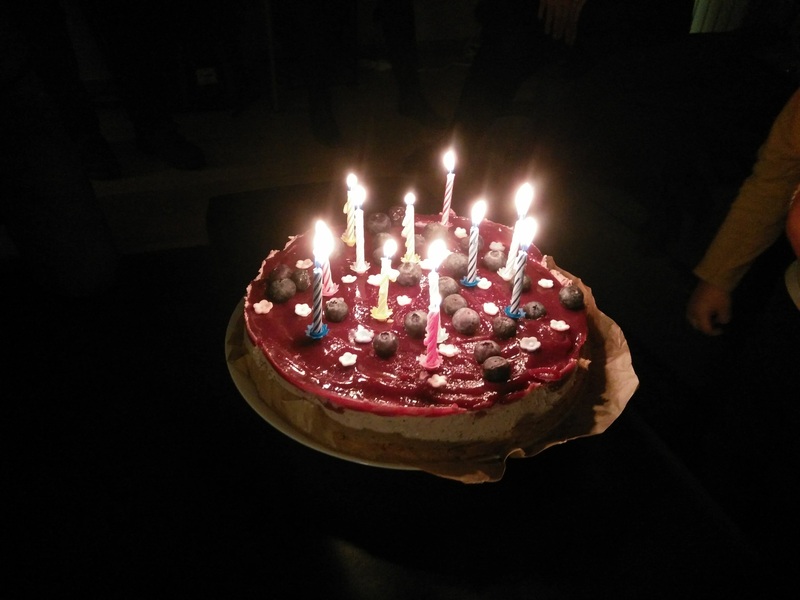 A couple weeks ago I presented Jan with several options for his birthday cake, and of them he chose an apple & blackberry cake. Since we were going to be sharing with friends, one of them needs to eat gluten & lactose free, I went and adapted the original recipe. And here is my version. Preheat oven to 170°C / 150°C if using convection. Line the bottom of a 20-22 cm spring form with baking paper. Soften the coconut oil by either leaving it in a warm place or microwaving it at low power for 30-45 seconds. Add the sugar and mix until well combined and sugar starts to dissolve into the oil. Add the eggs, one at a time, to the oil-sugar mixture, and mix well. Add the vanilla essence and mix. Combine ground almonds, oat & corn flour, salt & baking powder in a bowl. Add to the oil-sugar-egg mixture slowly and mix until a smooth dough has formed. Peel and core the apples, slice them in 12-14 pieces each. Separate 8 slices for decoration, and cut the rest in smaller pieces. Add the apple pieces and most of the blackberries (leave 4 for decoration) and fold gently. Pour the batter onto prepared spring form and spread (more or less) evenly. Decorate with the reserved apple slices and blackberries. Mix sugar and cinnamon for topping and sprinkle on top of cake. Bake cake in preheated oven, middle rack, for 50-55 minutes. A cake tester inserted in the middle will come out clean (albeit greasy) when cake is ready. Loosen the edges of the cake with angled spatula / knife, let cool enough to remove cake from spring form and let cake cool on cooling rake. Another invite for dinner at friends calls for another dessert to be baked. It had to be vegan (=egg & lactose free), gluten free and nut free. And I just didn’t fancy repeating something I had already made. 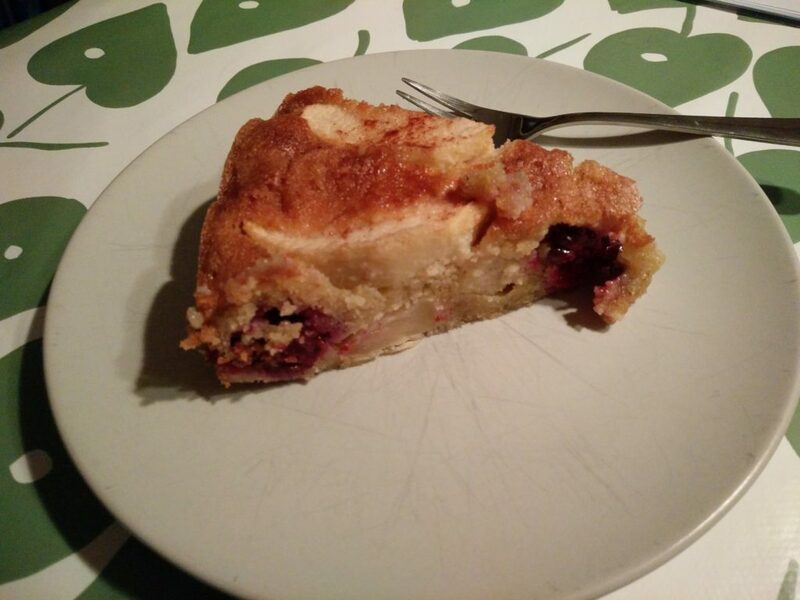 For some reason frangipane tart had lodged itself in my head, and so I decided to make one. In a stand mixer (paddle attachment) or food processor, mix all ingredients until a ball forms. Press crust on the bottom and up the sides of a loose bottomed fluted tart mold (24cm diameter). Bake crust in preheated oven for 15 to 20 minutes, until it starts to dry out. Take out and let cool for a few minutes (while you make the filling). In a stand mixer (wire whisk), or by hand with a very stiff whisk / electric beaters, mix all ingredients for the frangipane until a smooth consistency is achieved. Scoop most (you might have leftover) filling and fill the pre-baked crust, leaving a bit of head space (about 5mm). Slice plums in half, remove pit, and slice each half in thirds or quarters (depending on size and own taste). Arrange plum slices on top of the frangipane. Bake tart for 45-60 minutes at 180°C, or until the frangipane starts to turn golden and a toothpick inserted in the middle comes out dry. Let cool in mold on cooling rack. This recipe is heavily adapted from several vegan and non-vegan recipes. Feel free to use margarine instead of coconut oil. The amount of sugar in the filling can be changed to taste. Next time I might go for 125gr instead of 150gr, since it was more than sweet enough for us. What to do with the leftover filling: divide filling into ramekins or muffin tray, top with more sliced fruit, and bake for about 35 to 45 minutes. Try it with whichever fruit is seasonal and you like! It seems like I am in a blueberry kick. I do love me some blueberries, and since frozen ones are so easy to keep, it’s easy to reach for them for a quick dessert. 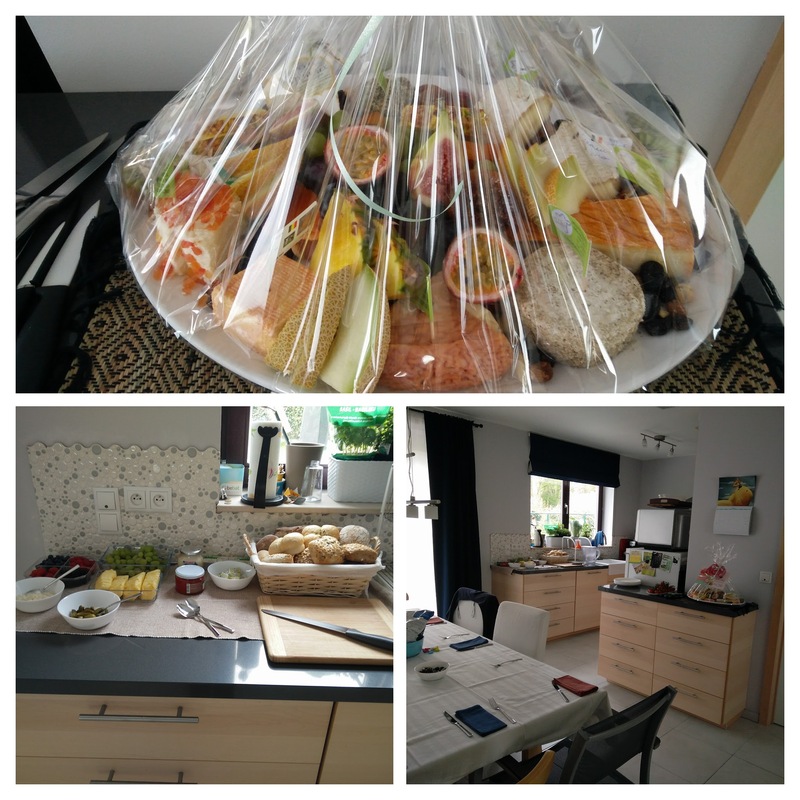 We invited the family over for Easter Sunday lunch. 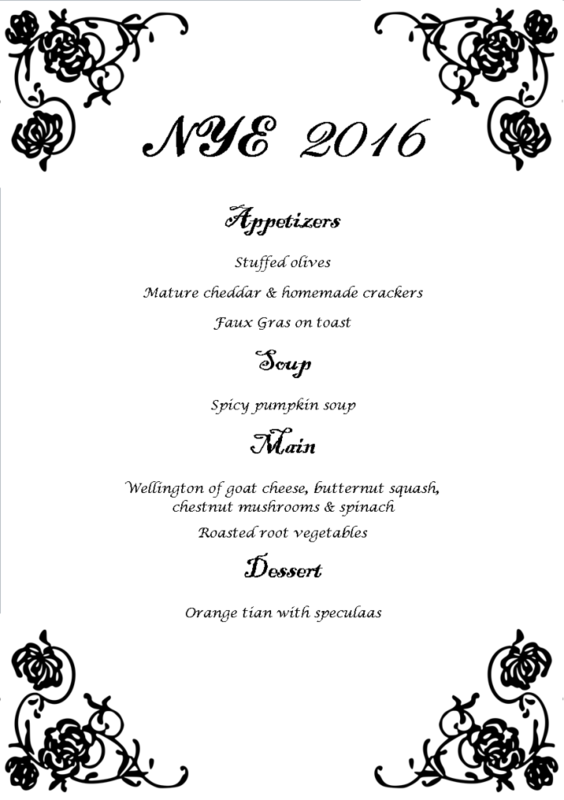 We served a selection of cheeses, fruit & breads. And for dessert I wanted something easy and quick, that wasn’t fiddly and could be baked while or right after lunch to have a bit later as dessert. I also wanted something relatively light (not loaded with butter and eggs) and with lots of fruit. A galette came to the rescue! While a traditional galette pastry is made with butter, this olive oil version turned out to be perfect as well. It stood up to the juicy berries, and provided a nice crunchy edge. Thanks to the tiny amount of sprinkled sugar, it also turned a nice shade of golden. Note that I didn’t pinch that one fold quite enough, and it folded back open during baking, letting the juices escape. Combine all ingredients for the dough in a bowl, starting with only 75 ml water. Mix it, adding more water if needed, and for a bowl with it. Let rest for an hour or while the berries thaw. Mix the all the ingredients for the filling in a bowl and let sit for an hour, or while the berries thaw. Roll out the dough into a (approximate) circle shape, about 25 cm in diameter, on a piece of parchment paper. You don’t want the dough to be too thin, it needs to stand up to being folded over the filling. 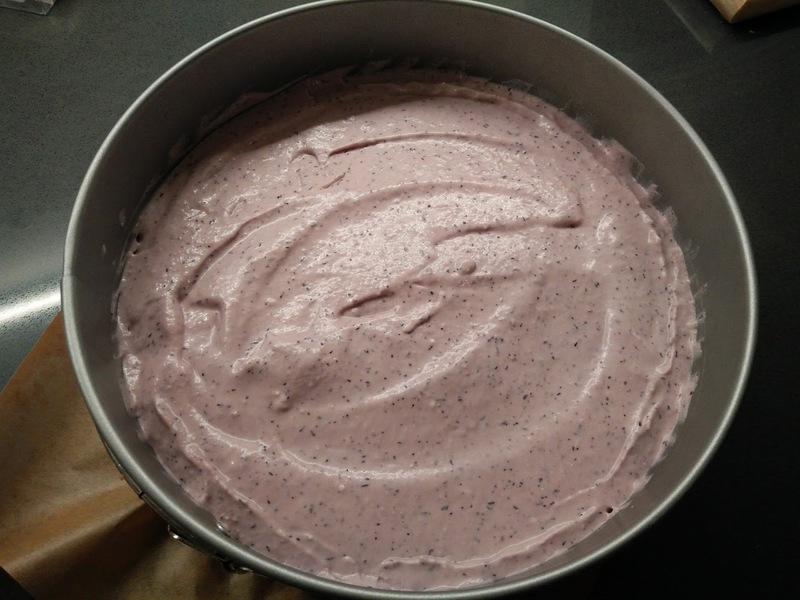 Spoon the berries on to the middle of the dough circle, leaving 4-5cm free all around. Reserve the liquid! Fold the edges of the pastry over the filling, pinching the folds so they stick together. Pour the reserved liquid on top of the berries. Sprinkle 1 tsp sugar over the pastry edges. 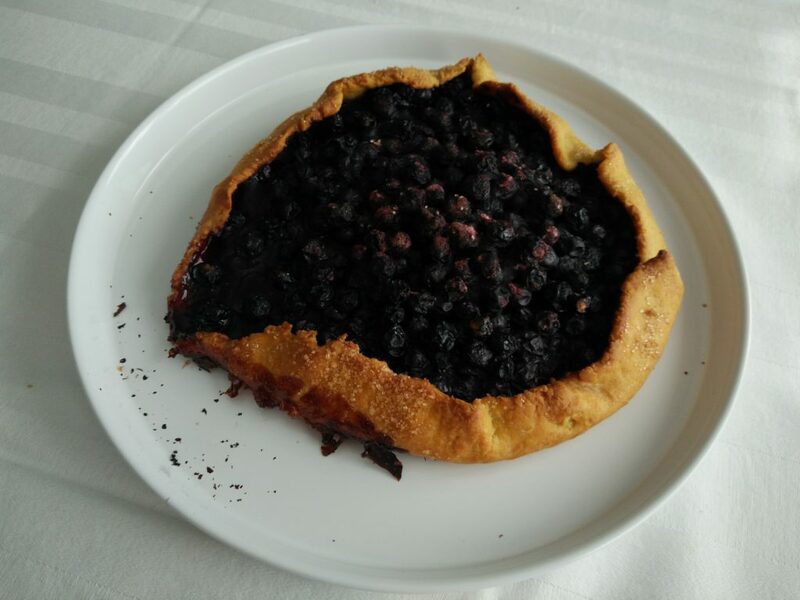 Transfer the galette (and parchment) to a rimed1 baking tray, and bake at 180°C for 30-35 minutes, until the berries are all jammy and the pastry is crunchy and golden. Let cool on a cooling rack for 15-30 minutes. Serve lukewarm, with ice cream if desired. Having friends over to visit means I get to bake. And I love it. Having friends over to visit with allergies and food intolerances, means I get to experiment with baking. Which I love even more. 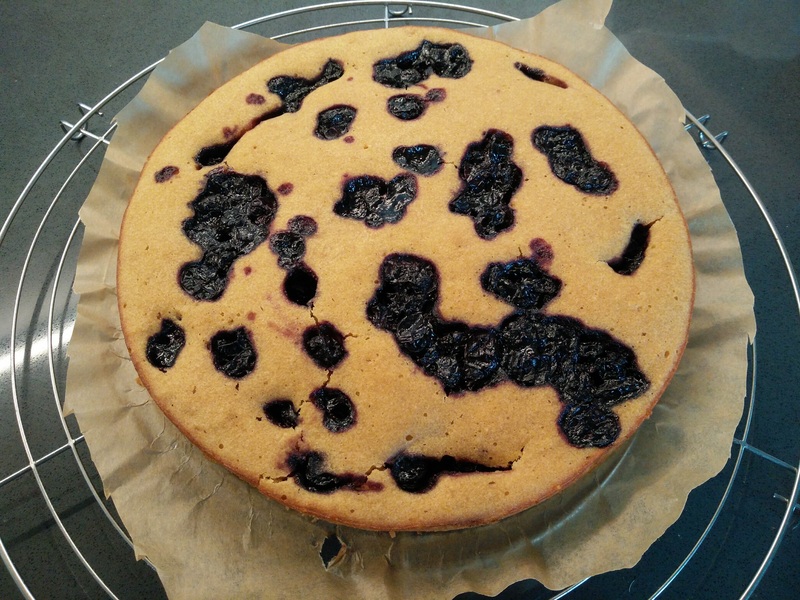 So after a week of searching the internet for a lemon blueberry cake that fitted the bill (vegan, gluten free, nut free, and preferably banana free), I found two recipes I could mix & match and adapt to my taste. From those two recipes a third was born, and I bring it to you. Put blueberries, sugar and water in a small saucepan. Bring to a boil, lower heat to simmer, and simmer, stirring from time to time, for 15 minutes. The compote will have thickened and have a glossy look. Line the bottom of a spring form with baking paper and set aside. Heat oven to 175°C. In a mixing bowl, add all wet ingredients (from lemon up to and including vanilla essence) and mix thoroughly so sugar dissolves. Add dry ingredients to mixing bowl, and whisk until no lumps remain. Pour 1/2 to 1/3 of the cake batter in a prepared form. Spoon half the compote on top of the cake batter. Top with the remaining cake batter, and then the remaining compote. Swirl with a knife / toothpick if wanted. Bake cake in pre-heated oven for 35 minutes, or until a toothpick inserted in the middle comes out clean. Let cool in tin for 15-20 minutes, then loosen rim, remove cake, and let cool on a cooling rack. As an aside, I realize I need to work on taking better pictures of my recipes. It’ll never be a step by step because who has time for that?! But I really want to remember to take a picture of the plated cake, not just the teaser picture of the cake cooling on a rack, before diving into it. I keep forgetting, because I want to try it! And I want friends to try it! A few days ago we got an invitation for a friend’s “Flower-power” spring themed birthday party. She requested that we bring something that reminds us of spring. So not wanting to do the typical spring flowers, and my idea of a jar filled with natural fertilizer1 being banned by the other 50%, we settled on cake. My first idea was to create a three layer lemon-poppy seed cake, with a fruity filling, cover it in yellow marzipan, and then decorate it with sugar paste flowers (daisies, mostly). But the store being closed and a certain lack of ingredients and time meant I had to find an alternative. Pinterest2 and a childhood memory of no bake cheese cakes to the rescue. 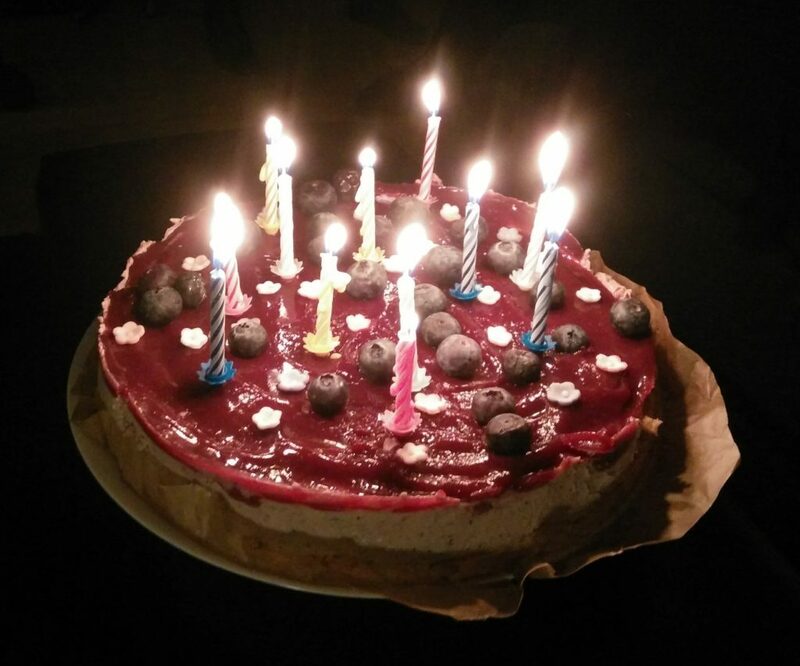 After browsing for a while for spring-themed cakes, I settled on a blueberry no bake cheesecake. Mixing a vegan recipe, with a not even vegetarian one (the childhood cake uses gelatine3, and turning it vegetarian was a challenge. And it turned right the first time round! I basically adapted & mashed so many recipes that it’s not even worth it mentioning them, since this cake doesn’t resemble any of them any more. Line the bottom of a spring form with baking paper. Place spring form on dish (the cheesecake will most likely leak a bit). Melt butter in microwave or pan over medium heat. Meanwhile, crush cookies to thin dust either in a food processor or by wacking them with a rolling pin. (Second option recommended if you have anger you need to get rid of). Mix butter & cookie crumbs until it resembles wet sand. Pour mixture into lined form and press with hands to create an even crust. Place in refrigerator while making filling. Pour 250 ml of cream into a small sauce pan, sprinkle 2 grams of agar agar powder on top and let soak for a few minutes. Bring to a simmer, and whisk to dissolve agar agar. Simmer for a 3-4 minutes, whisking regularly to make sure it doesn’t burn to the bottom of the pan. Meanwhile, in a blender, blend blueberries with remaining cream. In a mixing bowl, mix cream cheese, yogurt, sugar, lemon zest and juice until smooth. Add blueberry mix and mix until well combined. Add agar agar cream to the blueberry mix and mix thoroughly. It should start setting and it can be whipped to a creamy consistency. Pour into spring form with crust and even top out with a spatula. Chill in refrigerator while making topping. In a blender, mix blueberries and sugar with about 100 ml of water until smooth. Sieve blueberry mix through a strainer to remove skins. Add enough water to the mix to make 500 ml. Pour into small saucepan and sprinkler agar agar on top. Let sit for 5 minutes for agar agar to hydrate. Bring to a boil, lower to simmer and whisk to dissolve agar agar. Simmer for 3-4 minutes, whisking to make sure it won’t burn to the bottom of the pan. If present, remove white foam from top of blueberry jam with a spoon before it cools down. 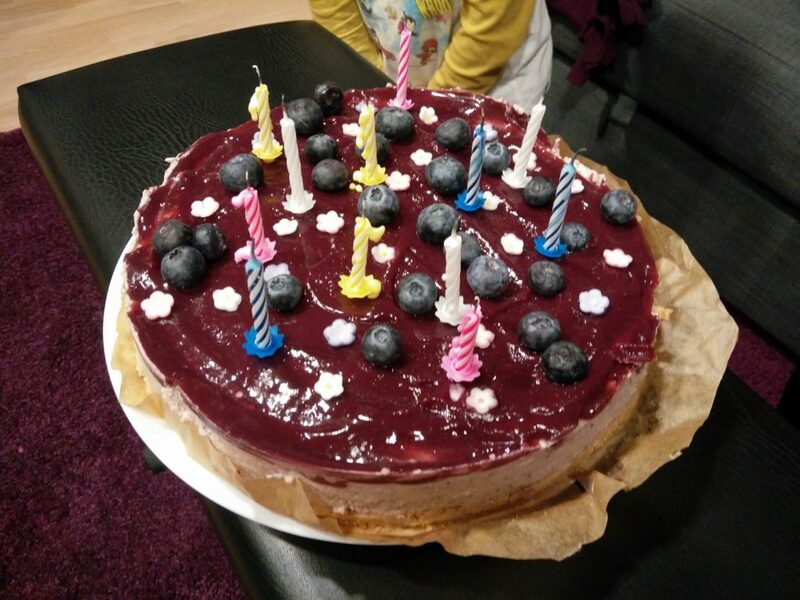 Let blueberry jam cool to around 50°C, pour on top of cheesecake. Quickly tilt spring form around to distribute the topping evenly. Place sugar (and / or fresh edible) flowers on top. One benefit of using agar agar however, the cheesecake & topping will withstand higher temperatures since it won’t un-gel with warmth. So this is an ideal dessert for the summer months! 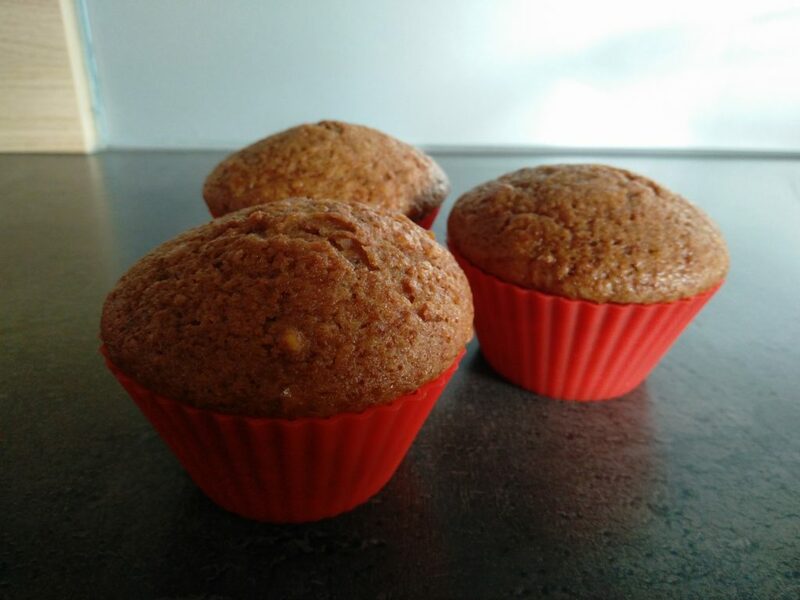 These muffins are based on the previous recipe, Pumpkin muffins, but aren’t gluten free. 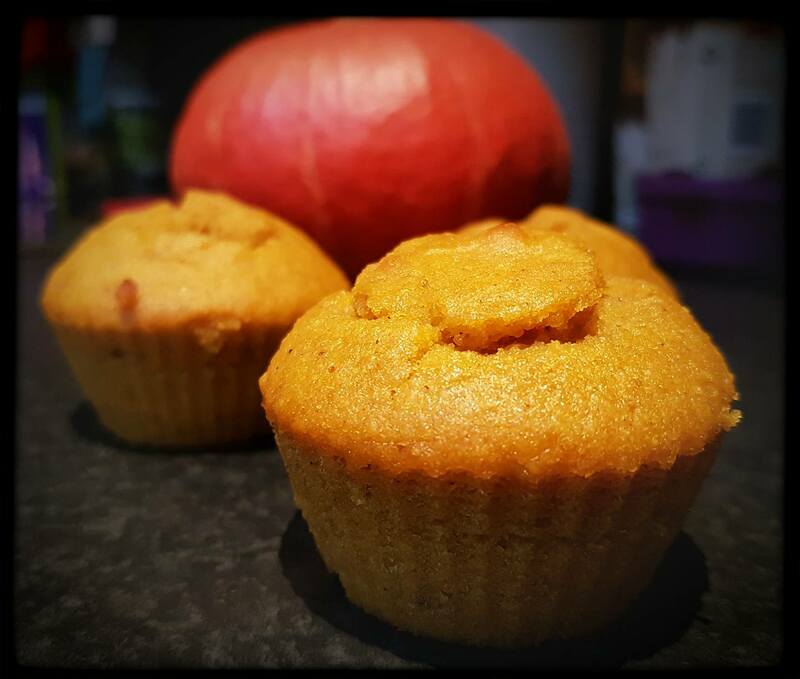 Inspired by a jar of apple sauce that needed using up, and having a day of board games planned, baking muffins to feed our friends (other than crisps, fried stuff & sandwiches) sounded like a good idea. The muffins are ready in 45 minutes. Total. Of those, 30 minutes are baking time, so you can do your cleanup meanwhile. Quick bakes are also a bonus point in my book! Preheat oven to 175°C. Line 12 muffin tin with paper or silicon liners. In a bowl, whisk together flour, baking powder, baking soda, salt and spices. In a blender, mix applesauce, olive oil, and sugar. Blend until smooth. Add eggs and pulse until mixed. Add applesauce mix to dry ingredients and mix until well combined. Divide dough between the 12 cavities. Bake at 175°C for 30 minutes or until a toothpick inserted in the middle of a muffin comes out clean. Let cool in muffin enough to handle, remove muffins from tin and let cool on rack. Lately I am experimenting with dairy / gluten / egg free baking. Having friends that are allergic / intolerant to one of more of those, and me liking a challenge, baking for them is a good opportunity. These muffins are both dairy & gluten free, but do contain eggs. I will experimenting with the egg part next. I am happy to say that they have a nice earthy spicy flavour, and a fantastic soft moist crumbly texture. Texture wise, they are faboulous, to be honest! Preheat oven to 175°C. Place rack in middle of oven. Line 12 cavity muffin tray with paper liners or silicon liners. In a big bowl mix pumpkin puree, eggs, sugar and oil very well with an immersion mixer. Alternatively you can use a blender. In a small bowl mix all flours, baking soda, baking powder, salt & spices. Add to wet ingredients and mix with a spatula until no blobs (very technical name) of flour are left. Divide batter among the cavities of the muffin tray. Bake in oven for 25-30 minutes, or until a toothpick inserted in the middle comes out clean. Let muffins cool enough to remove from tray, transfer to cooling rack and let cool (or enjoy warm, if you cannot wait). I really couldn’t wait to eat them so I forgot to take a picture before I started. Here you can see the nice crumb & fluffy texture of the muffins. … such as smartphones, is that it becomes obsolete. And after a while, it starts to fail. And that’s what’s happening with my trusty Nexus 4. I’ve had it for more than 2,5 years and lately it keeps dropping cellphone and gps reception. Which is annoying when you use it to navigate and are in the middle of nowhere. Anyway, since I don’t like paying premium for my phones, and I don’t require tomorrow’s technology – but I do want something better than I had, I decided to get a OnePlus X. And this is the story of that purchase (the phone hasn’t arrived yet). So, I selected my phone & accessories on the site, and clicked on purchase. This requires you to make an account. Ok, create an account: username, email & password, please check this box to let us know you’re not a bot. I got my account confirmation email, clicked on the link, account confirmed. So then I go to sign in, and hey, why do I bother with an username, when I have to use my email to log in! First failure on their part. Lastly, realize phone takes nano-sim, current phone takes micro-sim card. So I had to order a replacement from MobileVikings (affiliate link, please change provided, gimme credit!) – which used to be free, but now it costs 5€. Oh well. Now to see if the stars align and everything arrives on time. And in case anyone is interested in what we’ll be eating tonight, here you can find our menu. Just for the two of us. 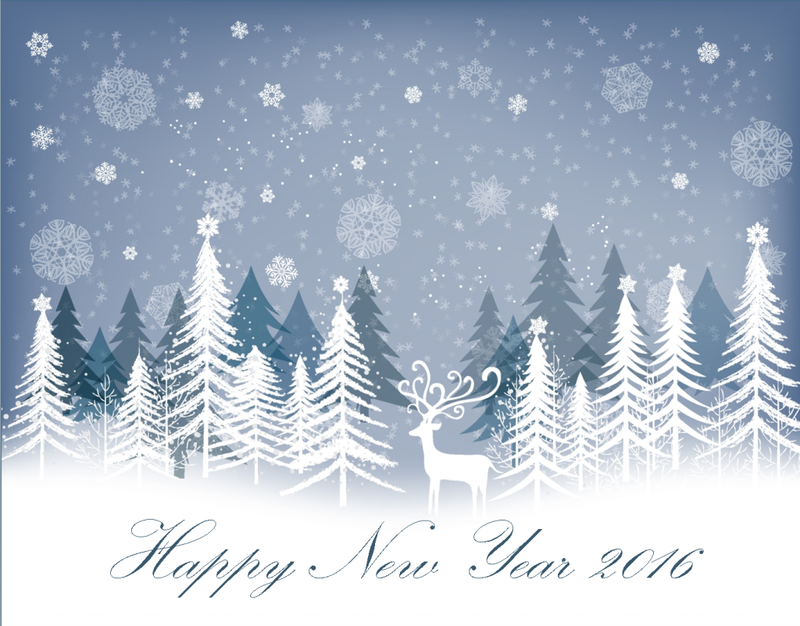 Hopefully everybody will have / has had a lovely end & start of the year.